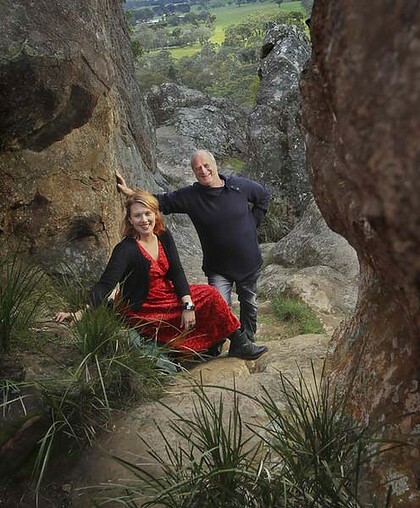 Ready to rock: Michael Gudinski with Clare Bowditch. This seems to be true, but we are waiting for official confirmation. go on sale on Monday 4 October from 9am. Oh my goodness how exciting! CONCERT CONFIRMED BOTH BY THE TOUR MANAGEMENT AND AEG LONDON. PRESALE INFO WILL BE POSTED ON WEDNESDAY. Now does anyone want my Friday night Rod Laver Arena tickets? At one minute past noon today (Wednesday 29 September) I purchased my tickets for Leonard's Hanging Rock concert on 20 November 2010. When I was part of the memorable night he played at Rochford Winery in the Yarra Valley, just before so much of our valley was consumed by bushfires, I never thought another chance would come again to hear him and his friends at such a venue. Hanging Rock is a magical place and I am so thrilled so be able to look forward to being there. Like cecilia, I was also hovering over the computer a few minutes after noon EST to grab some of the Frontier pre-sale tickets for the Hanging Rock shows (row E). I will admit that when I first saw the line-up for the Aus & NZ tour, I was a bit disappointed that it included only indoor (mainly gigantic sporting arena) venues. Having seen some of the 2009 Winery shows as well as some of the other concerts on that tour, I can say that there is a completely different -- and I think better -- atmosphere at the outdoor shows. I'm very glad that this late addition to the 2010 tour schedule will allow us to see LC and band perform at such a venue. Plus, it sounds like quite a magical place. I can't wait! Just tried this (for fun...) but it looks like the password is invalid (link takes you to "Frontier Members Presale"...). Can you please check this? Thx! I was able to get my tickets this morning Maarten. Imagine - Lissadell and Hanging Rock concerts for us in the one year (and Sydney). Could you get more amazing venues to listen to Leonard Cohen? I'm thrilled for you both! Met you briefly at the Garavogue in Sligo. No..it is hard to imagine being present in 2 such magical places for a Leonard Cohen concert...both in the same year! When this was first hinted at, I checked flights to and from Melbourne, car rentals, and accomodation, but then decided it was simply more than my budget could bear. Hah..the word "budget" seems unrelated to attending Leonard Cohen concerts Hanging Rock has fascinated me ever since I saw the film many years ago...and once again a few months ago! Enjoy every moment! My spirit will be travelling with you!